European Mobility Week takes place every year from 16-22 September. This European initiative encourages towns and cities to introduce and promote sustainable transport measures and to invite people to try out alternatives to car use. The theme for 2018 is ‘Multimodality’ and European Mobility Week has adopted the call-to-action ‘Mix and Move!’ to promote the idea of choosing different modes of transport to get around urban areas. Combining different modes of transport means maximizing their benefits for passengers: costs, rapidity, flexibility, comfort, reliability, etc. It also has benefits for society: reduction of pollution and congestion, improvement of quality of life and health, etc. The growing trend towards digitalisation in urban mobility is a key driver in the promotion of multimodality. The Week culminates in the ‘Car Free Day’ event, officially designated as 22 September (but choose your own day during the school week), when one or several areas are set aside solely for pedestrians, cyclists and public transport for a whole day. 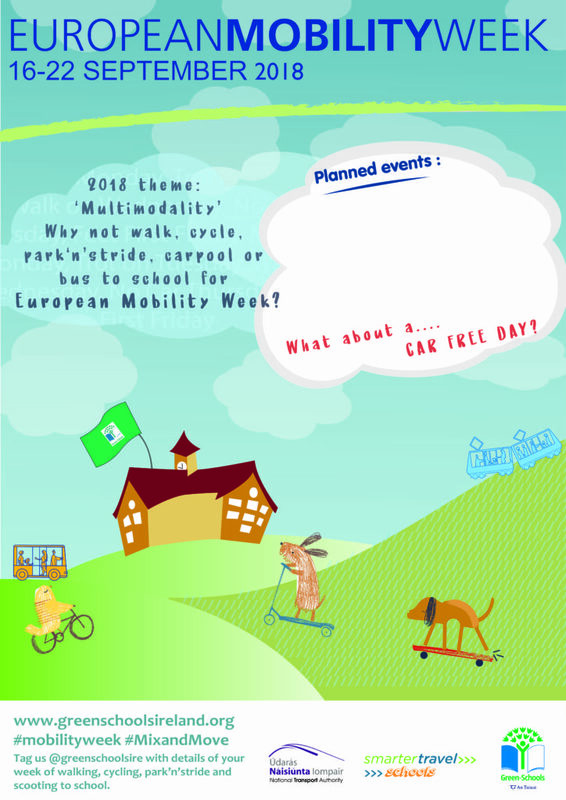 Taking part in events during European Mobility Week will complement the work your school undertakes for the Green-Schools Travel Flag Award and also gives schools the opportunity to raise the profile of sustainable transport to school. • moving towards zero emission city logistics in major urban centers by 2030. Open a ‘mobility centre’ in school. Provide information about services (e.g. maps, travel advice, timetables). Do an opinion poll and ask people what they think of the routes to school. Publicise your travel/action plan. Promote responsible car use and offer eco driving/fuel saving tips. Designate a safe drop-off zone or park ‘n’ stride location. Set up an exclusion zone in front of the school that cars are not allowed to enter. Organise a survey (Environmental Review) to see how many people changed their mobility behaviour during the week. Interview people who left the car at home. Publish the most remarkable results/stories. Launch action days e.g. WOW / COW / SOW /‘Car Pool to School’ Day / Car free day / Park’n’Stride. Offer a healthy breakfast to those that use alternative transport. Ask local companies to donate healthy foods or ask the Parents Association to make smoothies, pancakes, fruit salads etc. Download the Green-Schools EMW Poster 2018 here.